My little boys are so much fun, and so full of energy! They keep me on my toes for sure. Especially this little one! We recently switched Reid from a crib to a bed and this is all about how his room turned out. He loves to be outside, so I went with some camp vibes. Actually, it’s funny how you know your child before they are born. A lot of these pieces were from his nursery. I also shared my older sons outer space room here! All of the signs on the wall are from Etsy, the Happy Camper sign was a print and I just picked up a frame at a local store. The little deer head is from Target. I got this little felt fire from Etsy, it was part of his nursery decor and I’m so glad it transferred over to his big boy room. I just love it. This tent is Reid’s little reading nook. If you came to this post after my other son’s room, you’ll know that these little nooks are to help them grow imaginatively and to hopefully increase their interest in reading. This bookshelf from Land of Nod is perfect for this space. It fits perfectly and it holds just enough books for a bedroom. So, I got this comforter and shams from Target for $40! I was so pleased with myself. When I went to look it up to link it for you, it’s no longer there, but I found a better one. One I may purchase and switch out actually. 🙂 I linked the items at the end of the post. Oh, and seriously it’s the most comfortable comforter ever. So soft and cozy. Don’t mind the wrinkles, I don’t iron (true story) but how fun are these sheets! 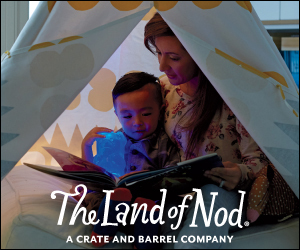 They are from Land of Nod. So are the adorable little throw pillows. Aren’t they so fun! Reid likes to sleep with the tree, I don’t know why, but his little finger always points to it on the wall rack (pictured below) and he says, “that piwoah” in his almost 3-year-old little voice. Melts my heart. I love having this wall hook here for books to read, and he likes switching them out as well. We got the dresser from Wayfair, my husband wasn’t happy that it came flat packed and he had to put it together, but it ended up being a nice quality. The drawers are nice and deep too! Reid’s aunt got him his moose bank when he was born. Ugh, the paint color looks so yellow here, It’s really not. Anyway, I got this animal head from Target. Reid says goodnight to it every night, my husband thinks it’s scary and I love it. haha Although, I’m not really sure what animal it is? Anyone know!? I still feel like I need a bit more for the walls in here but when the right pieces find me, I’ll let you know! I hope you enjoyed camping with us! If you have any questions, please let me know! If you haven’t already checked out Ethan’s space room, click here.